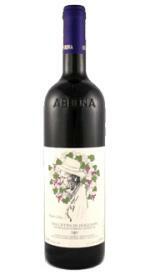 Enrico e Marziano Abbona Dogliani Papa Celso is one of the best Dolcetto wines on the market today. Abbona Dogliani Papa Celso Dolcetto, produced in my favourite region of Italy, the Piedmont, is a QPR king in a region where QPR is becoming increasing hard to find. The Piedmont, home to the king of Italian wines, Barolo, has a QPR trick up its ermine laced sleeve and that trick is Dolcetto (well, along with Barbera anyway!). A wine growing in popularity, Dolcetto is the wine the locals of the Piedmont drink daily but their cover has been blown in some style as the wine is being embraced like a brother across the pond in the good old US of A. Prices are going up, but not as up as they’re gonna be. The 2006 is the best vintage of this Dolcetto I have ever tried and whilst I can’t go 90, it’s close, as close as it can be actually, 89! Dolcetto is not really a wine for ageing though can be kept nicely up to around 10 years so this isn’t a wine to buy by the truck load and sit on in the hope of selling on at a much higher price. It is a wine to be enjoyed today. The Abbona Dogliani Papa Celso Dolcetto is a first class example of Dolcetto and should easily keep that long. It’s fairly rare for a Dolcetto to be scoring in the 90’s and only the very best get Tre Bicchiere’d and this is one, retailing under €15 is something unique. Founded in 1970 the vineyards of Enrico and Marziano Abbona are very productive with a great range of Piedmont wines from the grapes of the region. Abbona are famous for their Dolcetto but also produce above par Barbaresco, Barolo and Barbera wines as well as an interesting Langhe Bianco, which under my Veneto sun, is far more appealing today! Americans – Wine Chateau – $14 !on sale! What is your favourite Dolcetto, have you ever tried Dolcetto, do you aspire too, if so which? Piedmonte is also my favorite wine region of Italy. A good dolcetto is very affordable, which puts it on my radar screen.